Cleansing brushes have been at the forefront of the beauty industry for several years now, but many skincare addicts are yet to experience the wonders they can offer. Not only do the soft bristles make your skincare products go further, but they can also help to buff away deep impurities that have been bothering you for a while. If you’re looking to take your daily skincare routine to the next level, then you definitely need to add a cleansing brush to your collection. No matter what your skin type may be, from oily to dry there will be a brush that suits your needs perfectly. It can take a while to choose the right brush for your skin; you don’t want to inflame or irritate your face with the wrong brush head. Similarly, you shouldn’t give up on them too quickly either, as many beauty buffs often find it makes their skin worse before it gets better. This is simply because the dead skin cells and impurities need to come to head before you can get your gorgeous glow back. This is a super popular silicone cleansing brush, that is perfect for travelling due to it’s petite size and lightweight. The unique glove shape allows the silicone micro-fingers to give your skin a deep cleanse, so that you don’t miss any important areas. The sonic technology contributes to smooth massaging action which will relax and soothe your skin. The wonderful thing about the Solo Mio Sonic Facial Brush is that it is suitable for even the most sensitive of skin types as the brush head doesn’t consist of any hard bristles that will irritate you. The speed settings are also an appealing feature of this product as you can fourteen different options to choose from. You might choose one of the higher speeds for a deeper cleanse in the evening if you have a lot of tough makeup to remove. The results from using this product for several weeks are pretty good too. Not only does the pulsating brush give you a good massage, but it also helps to improve the elasticity in your skin. Over the course of a month or so younger and brighter skin is definitely visible as pores are reduced and blood circulation is enhanced. If you’re looking for a handy sized beauty tool that is suitable for all skin types, this is certainly the right choice for you. INNOVATIVE SKINCARE DEVICE - Cleanse your face of all dirt, reduce pore size, erase fine lines, and exfoliate your skin with a single handheld device! 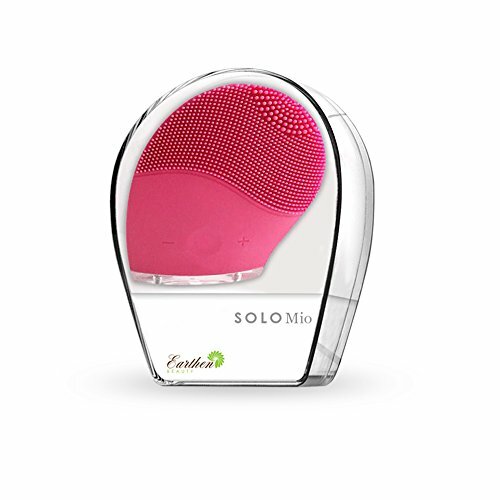 The SOLO Mio face cleaner and massager is your ticket to a healthier, acne free, beautiful skin. EXPERIENCE DEEP CLEANSING AND A FACIAL MASSAGE - Made of top grade silicone, the SOLO Mio applies gentle pulsations to your skin using thousands of silicone microfingers, which massage your facial muscles and exfoliate at the same time. The device is portable and waterproof, and it can run for more than a month without recharging! RESTORE YOUR YOUTHFUL GLOW - High frequency sonic pulses allow the removal of dirt, oils and makeup residues. Low-frequency pulses boosts blood circulation in wrinkle-prone areas, increasing the production of collagen and elastin to restore the skin's firmness and elasticity. SOLO Mio face cleansing brush allows you to decide which treatment is best for your skin. INSTANT DIFFERENCE - SOLO Mio is like a full facial in the palm of your hand. You'll be able to see an instant difference in your face - with glowing freshness, relaxed muscles, and added youthfulness. Your skin does so much for you - Now you can finally give back with SOLO Mio. OUR PROMISE TO YOU: There is NO RISK FOR YOU whatsoever with our 100% MONEY BACK GUARANTEE! Our goal is to help you feel better about your skin, your face, and your life - So if you're not 100% satisfied, don't hesitate to let us know. We'll make sure you get a FULL REFUND, NO QUESTIONS ASKED! This makes a great GIFT IDEA. Why not Buy Two Today 1 for yourself and 1 for your loved ones. This attractive and unique looking brush is certainly eye-catching, with it’s sleek, curved design. One of the most popular features of this brush is that it can be used safely in the shower as the device is protected against powerful water jets. This makes it much easier to weave into your daily skincare routine as it can be used anywhere. The three settings which range from high to low, gives you some flexibility in terms of your individual skin types. It’s definitely recommended that those with delicate skin should choose the lower setting, whereas more rigorous settings are ideal for those with thicker, more durable skin. The bristles on this brush are quite soft, which can make it quite tricky to get that deep exfoliation you’re looking for. However, they are the perfect texture for people with sensitive and easily irritated skin. This is the perfect device for people who travel often as the handy USB charging adapter allows you to plug it into a laptop or any other device with a port. If you’re looking for a shower friendly, portable and gentle brush, this should be your top choice. 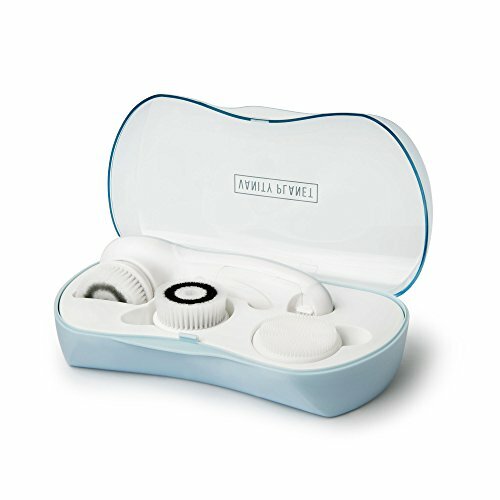 1, ULTRASONIC VIBRATION FOR MULTI-FUNCTION: The active technology has been applied in this Ultrasonic Rechargeable Cleansing Brush, conveying double vibration to gently remove your blackheads, whiteheads and minimize your clogged pores and smooth bumpy skin, exfoliate dead and dry flaky skin or aged corneum, fade away acne scars. 2, 3 BRUSH HEADS AND 2 Settings: MiroPure Electric Facial Brush has more effective cleaning than other brushes, which has 3 brush heads and 2 speed modes, 6 times cleaner than washing with hand and removes all traces of makeup, oil, and dirt. 3 , IPX7 WATERPROOF: Your 3 in 1 mini travel electric brush is 100% waterproof, You can take it into shower or bath tub to get the most out of your cleansing routine and use it freely while taking a shower. 4,PORTABLE PALM SIZE DESIGN: Mini design compact and easy to carry, takes up minimal room in your luggage.Keep your skin bright and smooth while at school, on vacation, visiting family or traveling for work. 5, 100% CUSTOMER-HAPPY GUARANTEE: Put your worries aside! 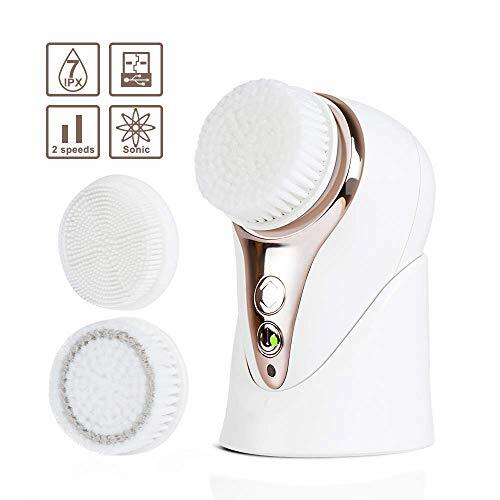 If you don't like this Ultrasonic Rechargeable Electric Facial Brush for any reason, you can just take advantage of our lifetime guarantee! We will replace it or give you your money back for any reason! NO QUESTIONS ASKED! It is very simple to get to grips with this two-speed rotating brush, which is designed for both gentle exfoliation and deep cleansing. If you’re looking for an affordable cleansing brush that still performs to the level of the other top brands in the industry, then this is also a good choice for you. This brush has proven to be a solid all rounder that works flawlessly for both men and women. After using a pore clogging foundation it is said to have cleared up unwanted acne in a flash. So if you’re in a hurry to bring your skin back to life this might just work a treat. 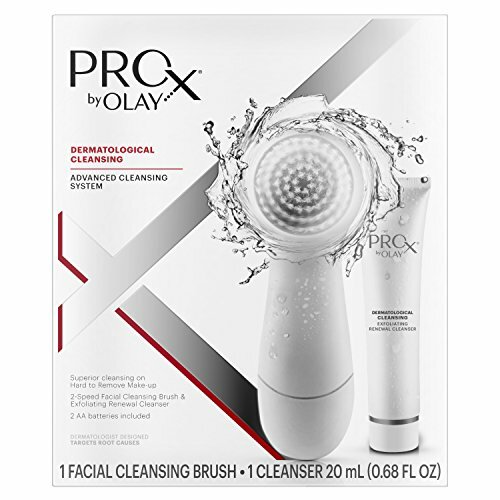 The ProX has also managed to reduce the size of enlarged pores on many beauty addicts, as the nimble brushes are effective at clearing out blocked pore. Similarly, it has also helped many users who are over the age of fifty to reduce the visibility of their fine lines and wrinkles. It seems this sonic face brush is the jack of all trades and has a proven track record of excellent results from a whole range of users. From acne elimination to wrinkle deduction, this brush will help do the trick. This cleansing brush set comes with everything you could ever need to get started with your new skincare routine. You will be pleased to receive a daily cleansing brush, an exfoliating brush and a silicone brush, which will all be effective in their own different ways. Depending on how sensitive your skin is and how much makeup you need to remove, you might change up your brush each day. The Silicone Facial brush is by far the most popular choice out of all three as the gentle spikes give you a calmer massaging effect. This brush looks slightly more intimidating than the others due to the silicone head, but it works perfectly for those with sensitive and dry skin. 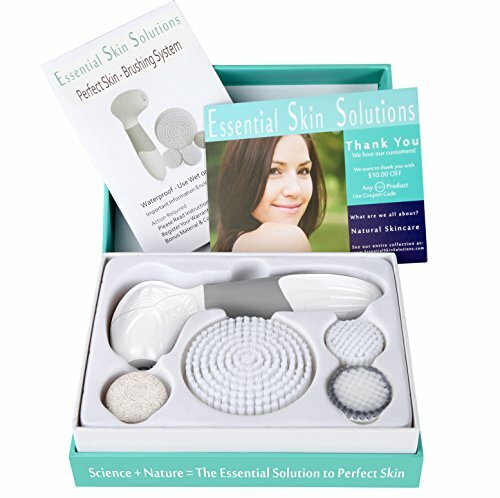 The stiffness and tightness that comes with using other cleansing brushes can be quite uncomfortable, but the Ultimate Skin Spa Facial Cleansing Brushes did not have this affect. Even if you use the deeper exfoliating brush, you won’t feel tautness or dryness in your skin after use. Acne sufferers are especially pleased with this cleansing brush as it has improved the quality of their skin gradually after several uses. Even those who have been using harsh antibiotic treatments such as Accutane have reported a significant difference in their acne after using these brushes regularly. Vanity Planet are also a cruelty free company, which is a huge bonus for many beauty lovers out there! This brush serves a multitude of purposes that won’t disappoint any beauty lover. Not only can you gently brush the skin on your face, but there is also a larger attachable brush that works wonders on your body. If you’re suffering from acne on your back, chest or arms, you have found the perfect solution to prevent and reduce these unwanted breakouts. The high quality of this product is evident from the outset. As soon as you open the packaging you will be able to see a chic design that you know will last you for a long time. The array of brushes is also appealing as you can adapt to your skincare needs whenever you like. It’s a good idea to start with the gentle brush head first, as you will be allowing your skin to build up a tolerance to this deeper form of exfoliation. Some find that the gentle brush doesn’t do as much for their skin as they would hope, so skipped straight to the deeper, more vigorous cleanse might be a good idea if you don’t have particularly sensitive skin. The overall results were definitely evident after a few uses. Your face will feel much cleaner after using this cleansing brush and it’s definitely recommended for acne sufferers. The firmer of the two brushes gets deep into your pores and you feel the tingling sensation as your product actually gets to work. Blackhead prone skin and people with enlarged pores will also see the benefits after just a handful of uses. Choosing the right cleansing brush will give you noticeable results as long as you can weave it into your regular skincare routine. The right brush will remove dead skin cells, which will expose new layers of skin. Over time this can produce the natural glow you’re looking for as long as the rest of your skincare regime is complementary to this. If you’re brushing in the morning, you need to make sure you use an SPF moisturizer as your skin will be more susceptible to sun damage. In the evening, it is also key to moisturize and protect the skin with a high quality barrier cream as the natural oils are often stripped away during this process. Overall, there are a whole host of benefits to cleansing brushes, whether you’re looking to get rid of deep rooted acne, or refresh dull, tired skin. Take your pick from the multitude of brushes on the beauty market at the moment and you will soon be able to get the glow you have been looking for. Copyright © 2019, SpaTrade.com. All rights reserved.